Today’s topics come from How Much Ram Do I Need On My Laptop? The original inspiration for this article came when Alex craftily turned the Surface laptop he’d just finished writing the review for into his daily driver and realized that our model, unfortunately only has 8GB of RAM, with no way to upgrade it. But does that matter? Well, the commonly held wisdom for years has been that, unless you’re some kind of power-user, 8GB ought to be enough for everyone. Well, hold on. With Windows 10 and Chrome devouring memory like Kobayashi at a hot dog-eating contest, we’ve been regularly seeing memory usage over 20GB just from web browsing on our writing workstations. Our testing rig has a Core i7-7700K, a GTX 1080Ti, and a 1TB SATA SSD. Then, we equipped it with 4, 8, 16, or 32 gigabytes of RAM. At each stage, we tracked pagefile usage with Performance Monitor, then, opened up tasks until we noticed activity. Once you reach the threshold where the system starts to swap data out of RAM and onto the boot drive, you might not necessarily see the system slow to a crawl or anything like that, but you could see a dip in performance or responsiveness if a tab or an application that you go to access has already been paged to your SSD or your hard drive. So first up is Chrome. We’ll be looking both at how many Chrome tabs are open when Windows starts using a pagefile, and how many are open when Chrome eventually becomes unusable. Bear in mind that not all tabs behave identically, I’ve seen some use 2GB of RAM on their own, but, we chose a mix of web pages that we feel should be representative of typical browsing behavior. With 4GB of RAM, we actually hit the pagefile with just 5 tabs open, and then after 13, Chrome crashed. Alrighty then. With 8GB we got to a respectable 25 tabs before any of them got swapped out, and managed 40 before the situation went totally south. With 16GB of RAM, we reached a fairly unreasonable 80 tabs open before page filing, and then Chrome finally crashed at around 180, then with 32GB of RAM we got all the way to 165 tabs before paging, and, frankly we didn’t feel like going through actually kind of laborious process of opening and loading 350 to 400 web pages in Chrome tabs, just to see the program fail. if you want that many tabs, you’re kind of doing it wrong, and this is coming from me. So, let’s move them into gaming. If all you’re doing is playing a game, I think you might actually be surprised by how little RAM you actually need. “Deus Ex: Mankind Divided” for example, which recommends 12GB of RAM, didn’t suffer too badly, even with only a single 4GB stick. Although, with that said, “Rise of the Tomb Raider” had some serious issues that were only sorted out by bumping up to 8GB of RAM. After that, though, performance didn’t change for either of them when we jumped to 16GB or 32GB. Do You Need 8 GB For Gaming? 8GB for gamers? Actually, maybe not. I mean, what if, *who* you don’t painstakingly close down all of your running applications every time you launch Steam? For those folks, we popped open our 10-tab test suite and an instance of Discord, to see if 8GB could handle it. And, surprisingly enough, there was no difference at all, with the exception of “Rise of the Tomb Raider”. That game seems to really love its RAM. So then, depending on the game, you probably won’t need 16GB of RAM to play it, but, it won’t give you a ton of breathing room for the future, and you might need to limit your background tasks for the best experience. What does anyone need more than 8GB of RAM for? Well, I would argue that any kind of workstation is going to want at least 16, and you might be surprised to find out that even more is pretty common for those kinds of systems. Alex actually has a number of Excel documents from his engineering days that, believe it or not, will not even open on a computer with 8GB of RAM, and has had some simulations of fluid flow or suspension movement that crash out, even with 16GB of RAM. Video editing can also be very demanding. But, this is heavily dependent on your workload. If you’re cutting together short to medium-length 1080p videos, 16GB should be plenty. But, the sky is the limit here. 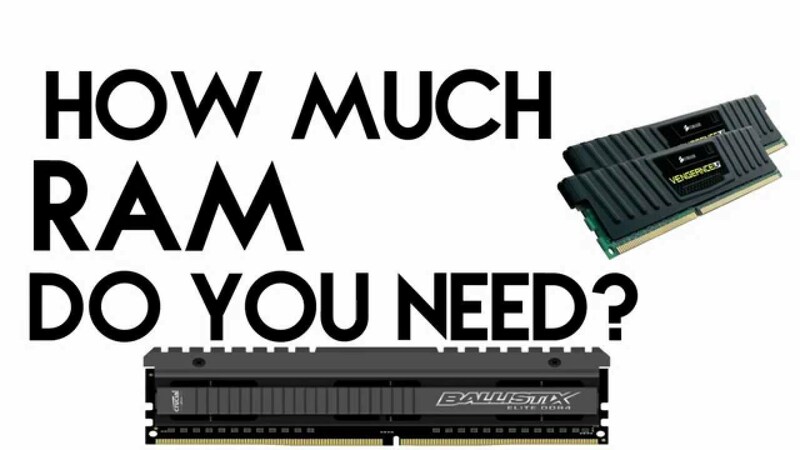 If you use tools like After Effects, you can expect 16 to be an absolute minimum, and as the complexity of your project increases, so does your RAM requirements. Our latest season of “Scrapyard Wars”, for example, because of how darn much footage was in the timeline, immediately crashes with anything less than 64GB of RAM. Now, it should be noted that all of what I’m saying concerns system memory, and not video memory, which is used for loading in 3D objects and textures for your graphics card’s use. This is very important for games, and also professional applications, but is probably a discussion for a different video, one I can almost guarantee will end with, “well, it depends.” 😉 One interesting side note before we wrap up is that as we moved up from 4GB of RAM, our system boot times actually got slower. It was only at most a second more, but, (and this is cool), if you’re aware of a Windows feature called SuperFetch, it actually makes sense. SuperFetch tries to intelligently pre-load some programs into RAM so that they’ll launch faster when you need them. So the idea is that if you run out and buy excess memory, it can still be used for something. Which doesn’t mean, though, that we’re saying to do that? As you might have noticed, RAM prices are out of control right now, so our recommendation for general users and gamers is: 8GB if you’re looking to scrape by and be ready to upgrade later, and 16GB if you wanna be comfortable for a while. As for the workstation users out there, well uh, it depends. 😉 And you know what else it depends on? Yeah, it doesn’t depend on that at all, forget it.